Raffaello Sanzio da Urbino (Raphael) (1483–1520), The Judgment of Solomon (1518-19), fresco, Loggia di Raffaello, Apostolic Palace, Vatican City. Wikimedia Commons. Many of the stories shown in paintings are complex if not rambling, and choosing the best scene is often tricky. The Old Testament story of the Judgement of Solomon is different: although it involves subtleties of human character and (in modern terms) Game Theory, there is only one moment which merits depiction, which is a coincidence of action, climax, and a form of peripeteia. Despite this, or perhaps because of it, this story was a very popular motif for paintings until about 1700, and has seldom appeared since. This is drawn from the Old Testament, the First book of Kings, chapter 3. 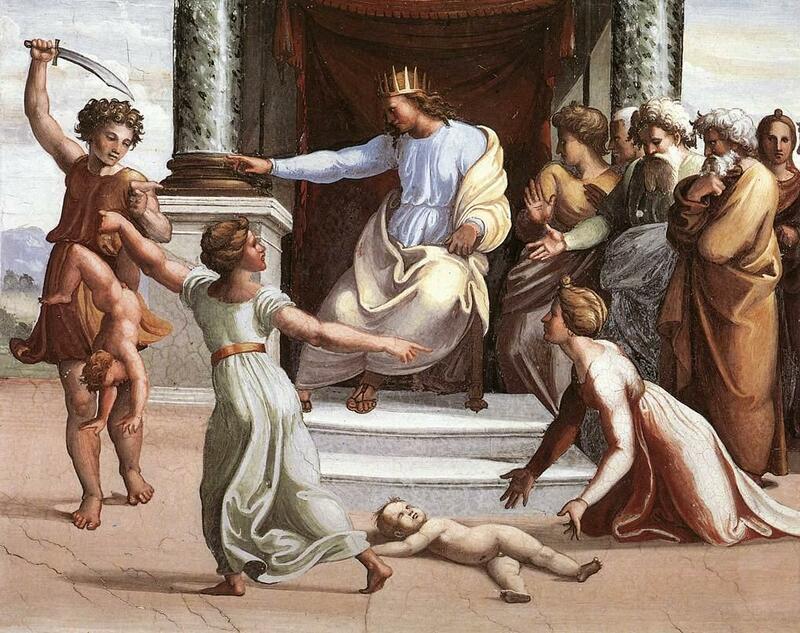 King Solomon was known for his wisdom and sense of justice. Like many kings, he sat in judgement over disputes, assuming the role of the ultimate court of appeal. One day, two young women (often interpreted as being prostitutes) who lived in the same house came to him seeking his judgement. Both had recently given birth to sons, but one of the sons had died, leaving the mothers in dispute over the surviving infant. Mother A claimed that mother B had accidentally smothered B’s own baby when she was asleep, so had taken A’s baby instead. B claimed that no such thing had happened, but that A’s baby had died, and the surviving baby was her own. So both mothers claimed the one living child as their own. After some thought, Solomon called for a sword, and declared that the only fair solution was to cut the live child in two, so that each mother could receive half of him. The true mother then implored Solomon to give the whole baby to the other mother if that would spare his life, but the liar called on Solomon to go ahead and divide the infant as he had proposed. From this Solomon deduced the identity of the true mother, and entrusted her with the infant’s care. The obvious moment to show in a painting is the threat to cut the live child in two. The preceding history can then be portrayed by showing both women and their infants, one alive and about to be cut in two, the other still dead. The resolution can be shown by the true mother’s reaction to try to spare the baby’s life, contrasting with the false mother’s obvious acceptance. I consider the pictorial solutions according to the compositional arrangement: the scene viewed facing Solomon’s throne, from the side with the throne at one side of the painting, and diagonally. Raphael’s fresco of 1518-19 avoids excessive symmetry by putting the courtier who is about to cut the live infant in two, that baby, and the true mother on the left, the dead baby in the middle in front of Solomon, and the false mother and a group of other courtiers at the right. The three key faces (Solomon, the two mothers) are shown in profile, which limits our ability to read their expressions. He has chosen the peak moment of climax, the sword held aloft and the real mother intervening to save her baby. Workshop of Lucas Cranach the Elder (1472–1553), The Judgment of Solomon (c 1537), oil on poplar wood, 206.5 × 142 cm, Gemäldegalerie, Berlin. Wikimedia Commons. Only slightly later, in about 1537, the workshop of Lucas Cranach the Elder produced a very different version on a panel. Much of the painting is taken up by the members and trappings of Solomon’s court, and the King himself is distant, appearing quite disengaged. This puts the mothers, their babies, and the sword-bearing courtier in the foreground, but there their roles are unclear. The moment is slightly earlier – before the sword is raised ready to strike – and this means that the true mother has not raised her protest. Antoon Claeissens (c 1536–1613), The Judgement of Solomon (1605-13), oil on panel, 100 x 128 cm, Private collection. Wikimedia Commons. 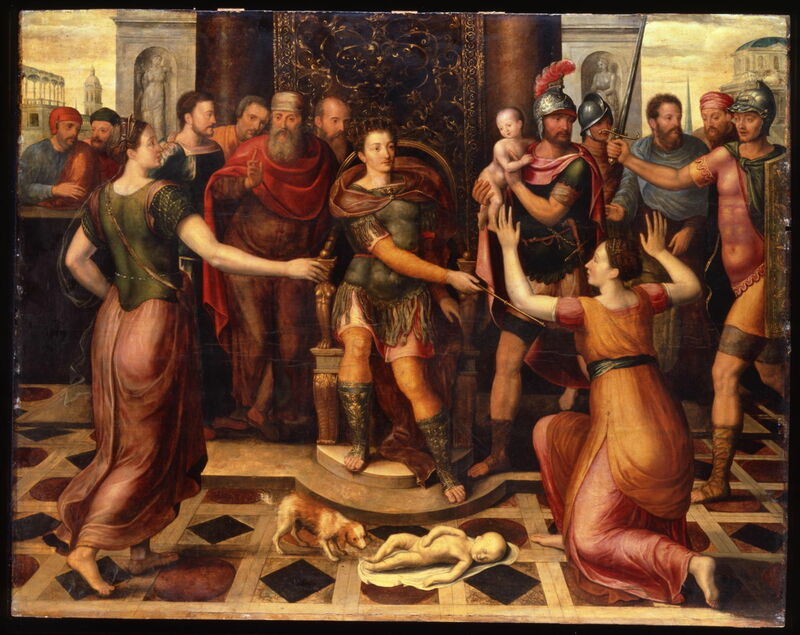 Antoon Claeissens panel of 1605-13 is clearer, but still not as brilliant as Raphael’s. The live baby is now held by a soldier, as another brandishes his sword in readiness. 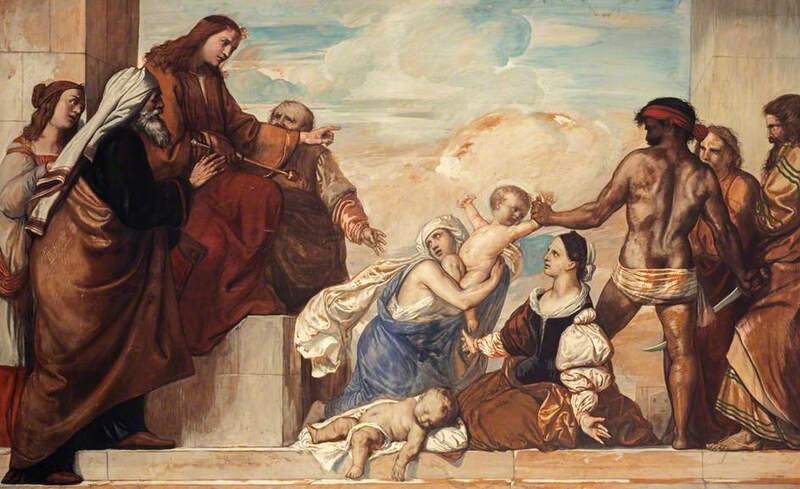 The true mother is presumably on the right, kneeling and imploring Solomon that the baby’s life is spared. But the timing is still a little premature, the reaction of the other mother ambivalent, and the true climax has been missed. He has the same problems as Raphael with showing emotion in the mothers’ faces in profile, too. Valentin de Boulogne (1591–1632), The Judgment of Solomon (c 1625), oil on canvas, 176 x 210 cm, Musée du Louvre, Paris. Wikimedia Commons. Valentin de Boulogne’s painting of about 1625 is closer and more intimate, shutting extraneous objects out in the dark, including the all-important sword. Here the sword has yet to be raised; although he suggests that the mother on the left is trying to prevent the baby from being cut in two, she is facing away, and both her facial expression and body language are harder to read as a result. The mother on the right clutches her chest and looks in earnest too, confounding the story. 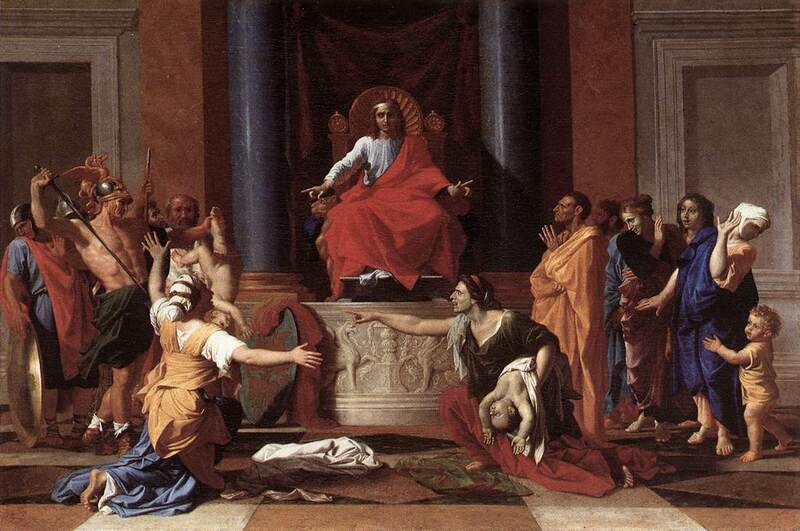 Nicolas Poussin (1594–1665), The Judgment of Solomon (1649), oil on canvas, 101 x 150 cm, Musée du Louvre, Paris. Wikimedia Commons. 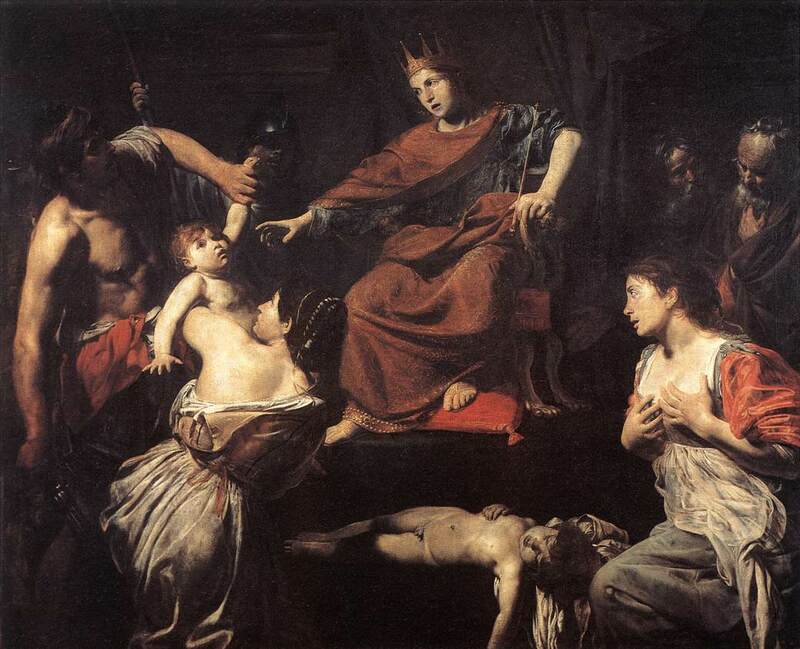 Nicolas Poussin’s famous painting of 1649 uses similar composition to Raphael’s, the mothers and their actions preventing it from becoming too symmetrical. Although timed slightly before the sword is raised, he depicts the body language extremely clearly. Solomon’s hands indicate his role as the arbiter, in showing a fair balance between the two sides. The true mother, on the left, holds her left hand up to tell the soldier to stop following the King’s instructions and spare the infant. Her right hand is extended towards the false mother, indicating that she has asked for the baby to go to her rather than die. The false mother points accusingly at the child, her expression full of hatred. Hands are also raised in the group at the right, perhaps indicating their reactions to Solomon’s judgement. William Blake (1757–1827), The Judgment of Solomon (c 1799-1800), tempera, 26.6 x 38.1 cm, The Fitzwilliam Museum, Cambridge, England. Courtesy of The William Blake Archive, via Wikimedia Commons. 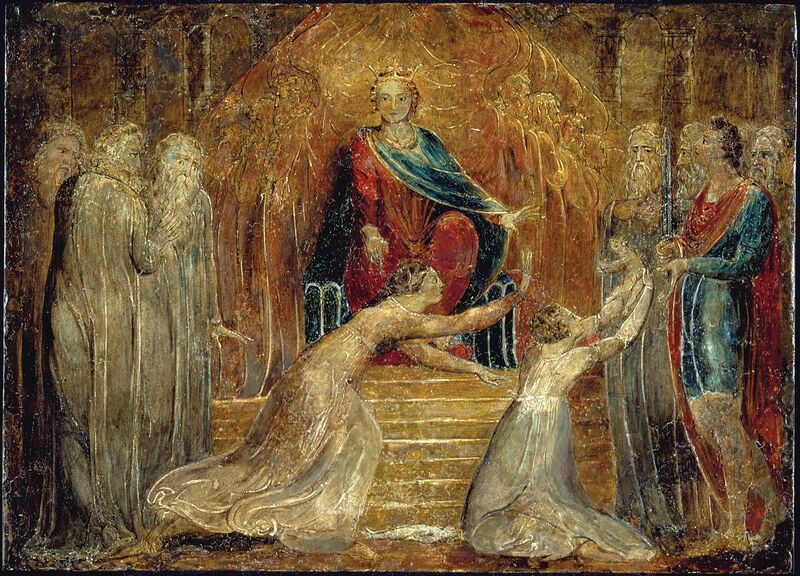 William Blake’s painting from 1799-1800 emphasises its symmetry behind the two mothers, which in turn lays emphasis on the asymmetry of the four actors. The sword is brandished rather than poised to sweep down on the baby, and both mothers are reaching for the infant. 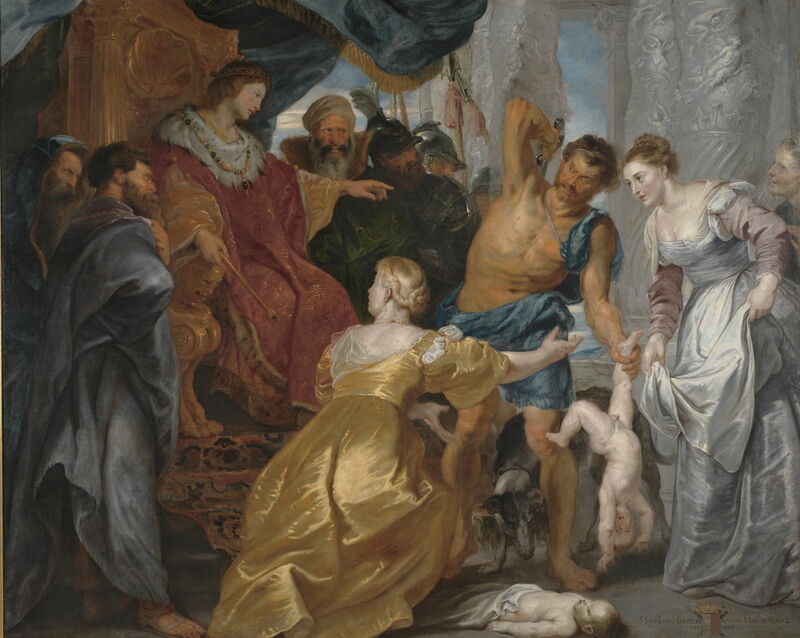 This leaves their roles unresolved, but the King’s left hand is held out to stay execution, the right pointing to the mother on the left, who is thus presumably the true mother, intervening to save the child. Giorgione (1477–1510), Judgment of Solomon (c 1505), oil on panel, 89 x 72 cm, Galleria degli Uffizi, Florence. Wikimedia Commons. 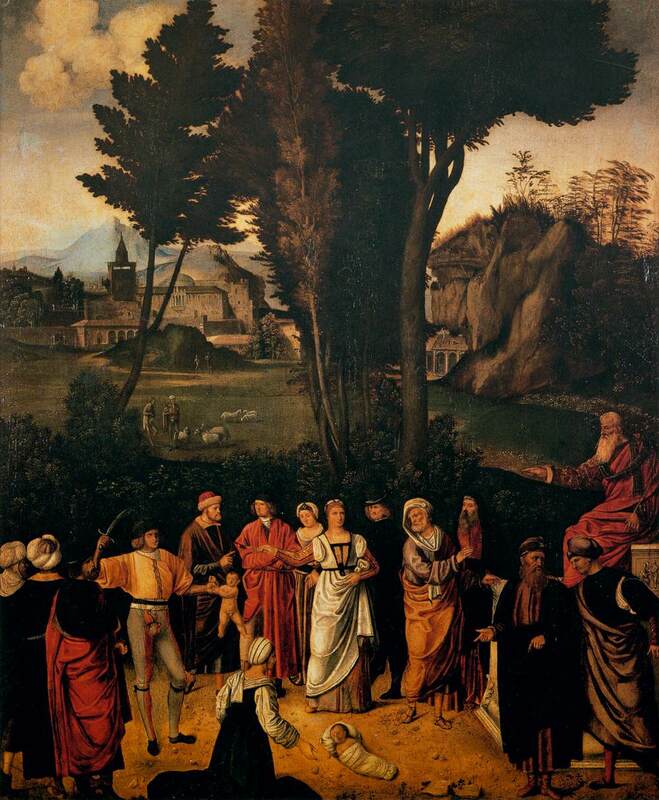 This panel attributed to Giorgione and dated around 1505 mirrors the composition of his Trial of Moses (c 1496-9), to which it might have been a pendant. Solomon is shown in advanced age, commanding the courtier who has raised his short sword ready. The two mothers straddle the midline of the panel, their body language not clear enough to indicate which is the true. José de Ribera (1591–1652), The Judgement of Solomon (1609-10), oil on canvas, 153 × 201 cm, Galleria Borghese, Rome. Wikimedia Commons. José de Ribera’s powerful painting of 1609-10 is far more eloquent of emotion. The courtier still has his sword in its scabbard, though, and the imminent threat to the baby he holds in his left hand is concealed as a result. The true mother stands right up against Solomon, almost but not quite touching him, her left hand reaching out to stop the sword from being drawn, the right poised over Solomon’s right hand, which is directing the courtier. The false mother kneels, less engaged, but looking up at Solomon with a degree of scorn. A few men at the right are debating the wisdom of Solomon’s judgement already, and there are two mysterious faces behind Solomon’s head. Didier Barra (1590–1644), The Judgment of Solomon (c 1630), oil on canvas, 38 x 49 cm, Private collection. Wikimedia Commons. 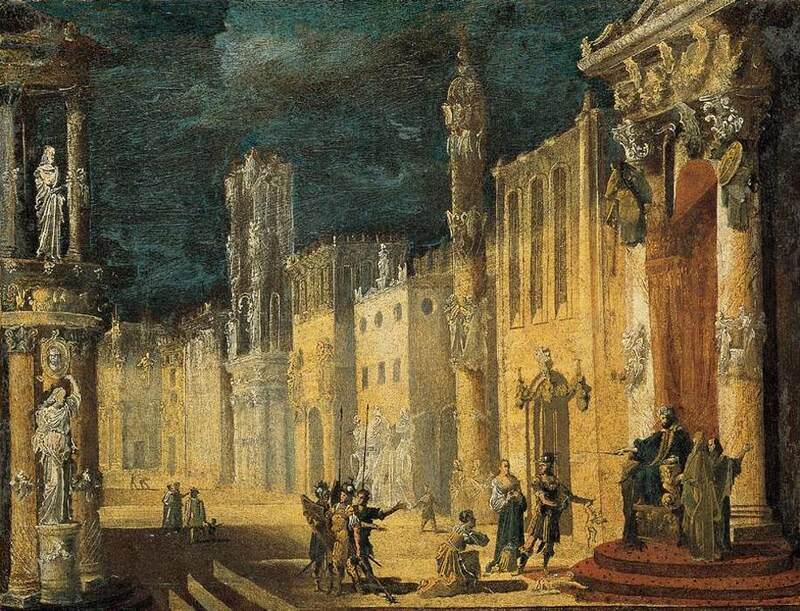 In about 1630, Didier Barra lost the story in his exuberant and elaborate depiction of the setting. 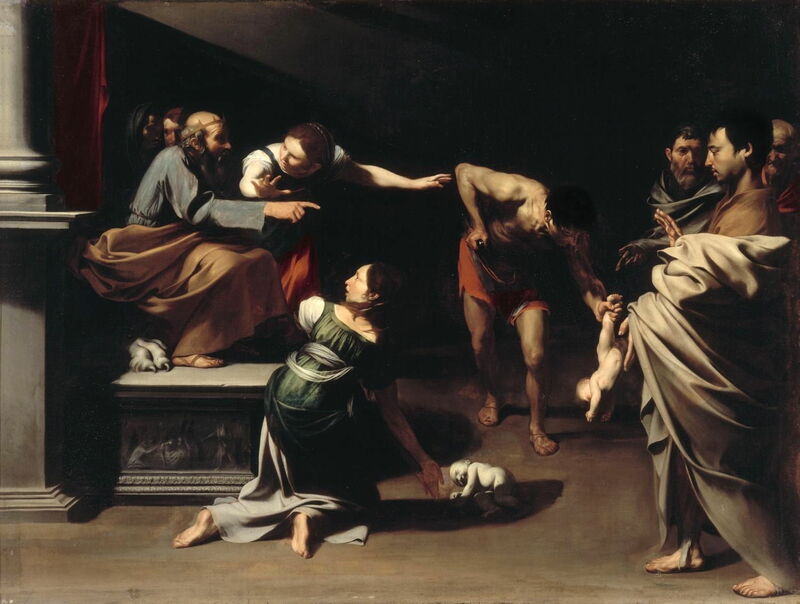 Although the actors are each apparently playing their roles well – the soldier preparing to cut the baby in two, the mothers reacting, and Solomon directing – they seem a side-show to his architectural study. 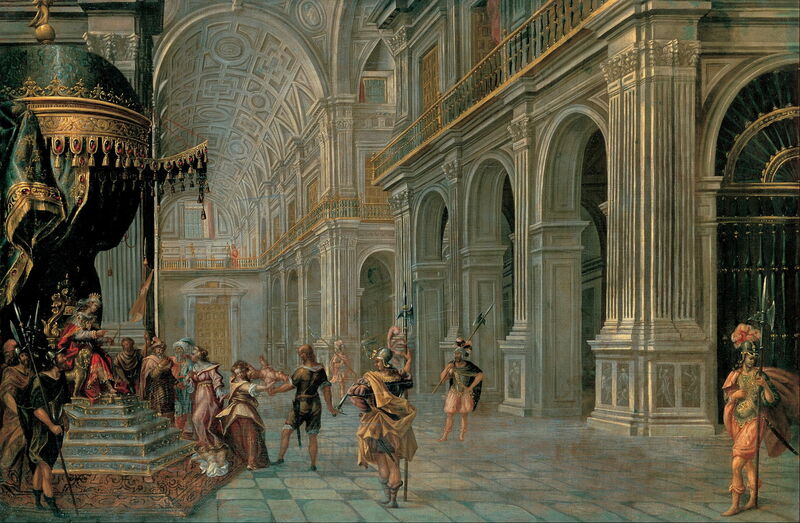 Francisco Gutiérrez Cabello (1616-1670), The Judgment of Solomon (1650), oil on canvas, 108 x 166 cm, Fundación Banco Santander, Madrid, Spain. Wikimedia Commons. Francisco Gutiérrez Cabello’s slightly later painting of 1650 almost falls into the same trap. Squeezed into the lower left sixth of its surface, it still manages to show the action, but working out which is the true mother is difficult. Putting both mothers and the living baby so close together makes it much harder to use body language to tell the story too. William Dyce uses the linear arrangement much more effectively. 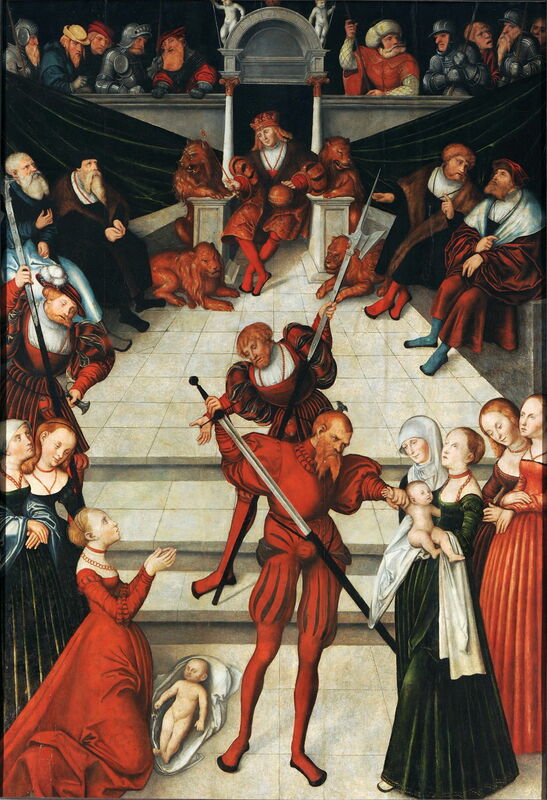 The two mothers intervene between Solomon, high on his throne at the left directing the courtier at the right, who brandishes his sword ready to take the baby and hack it in two. Despite the awkward angle, he gives us sufficient view of the mothers’ faces to make it clear which is which, and the true mother’s protective hold of the child confirms that. Peter Paul Rubens (1577–1640), The Judgement of Solomon (c 1617), oil on canvas, 234 × 303 cm, Statens Museum for Kunst, Copenhagen, Denmark. Wikimedia Commons. Peter Paul Rubens’ version of about 1617 has a more complex and sophisticated composition, the two mothers appearing on either side of the courtier rather than the King. By putting the true mother’s back to the viewer, so that we cannot see her face, we have to place complete reliance on our reading of her body language. We get a much better view of the false mother’s face, which is left surprisingly neutral in expression, and her body language is also not particularly helpful. In the end sufficient clues are given to enable reading of the painting, but its story could have been rather more plain. Antonio Molinari and workshop (1655–1704), The Judgement of Solomon (c 1690), oil on canvas, 112.6 × 133 cm, location not known. Wikimedia Commons. Antonio Molinari and his workshop in around 1690 preferred an even closer and tighter view of just the principal actors. For once the King seems detached and not in control, which significantly weakens the story. Both mothers are together at the right, one bent forward apparently pleading for the baby’s life, the other seemingly disinterested in events. The courtier armed with his sword takes the left, where he is put in the spotlight, ready to cut the infant in two. I think this works rather well in the end. 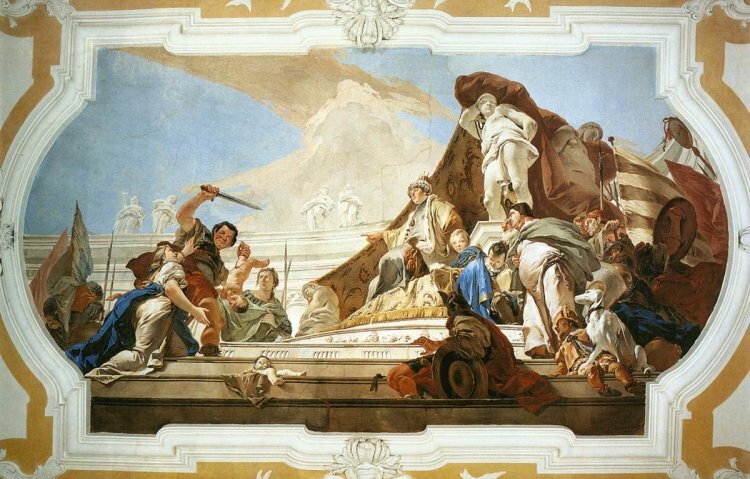 Giovanni Battista Tiepolo (1696–1770), The Judgment of Solomon (1726-9), ?fresco, dimensions not known, Palazzo Arcivescovile, Udine, Italy. Wikimedia Commons. 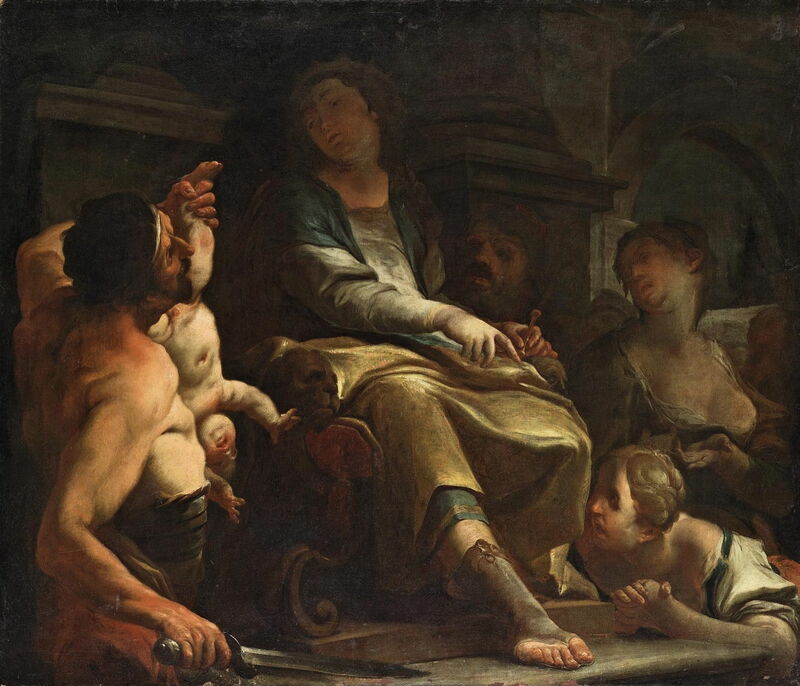 Tiepolo faced a tougher task when he painted this story on a ceiling in 1726-9. The consequent limitations to reading facial expressions force him to make body language even clearer, and bear the weight of telling the story. The true mother reaches up to prevent the courtier from cutting the child in two, while the false mother sits passively watching behind the baby. That cluster of figures – both mothers, the courtier, and the bay – turns out to be both powerful and effective, although it may perhaps have been even more effective if he had come in closer to crop out other irrelevant detail, and heighten the viewer’s engagement. Despite the limited choices in timing and content needed to tell this story, its composition has proved an interesting challenge. As in many confrontational situations, putting the main actors in positions where their faces and body language can be read is often difficult. A head on view gives an excellent opportunity to show King Solomon, but readily obscures the faces of the mothers. A side view may simplify the actors into a more linear arrangement, but also makes it hard to follow Alberti’s rules. Key to telling this story clearly is making obvious contrast between the two mothers, to establish which is the true, and which the false. I think that Raphael, Poussin, de Ribera, and Tiepolo achieved that very well by placement and body language, as you might expect from those Masters. Posted in General, Painting and tagged Barra, Blake, Cabello, Claeissens, Cranach, de Boulogne, de Ribera, Dyce, Giorgione, Molinari, narrative, painting, Poussin, Raphael, Rubens, Tiepolo. Bookmark the permalink.